Stumbled upon this today. A lowering kit made by Yani Shiki. Has anyone seen this? I'm curious how difficult it would be to install. I put a lowering kit on my last bike, (K1300S), and it was a five minute job. It might be nice to drop the bike an inch. Easy to install, no more difficult than the K13 except you have to work around that cat, makes it hard to get the bottom bolts out. Personally I wouldn't do it, dropping the rear without doing the same to the front will mess up the geometry. But obviously a lot of people do, or vendors like this one would not be around. Go for it, you can always remove it if you don't like it. 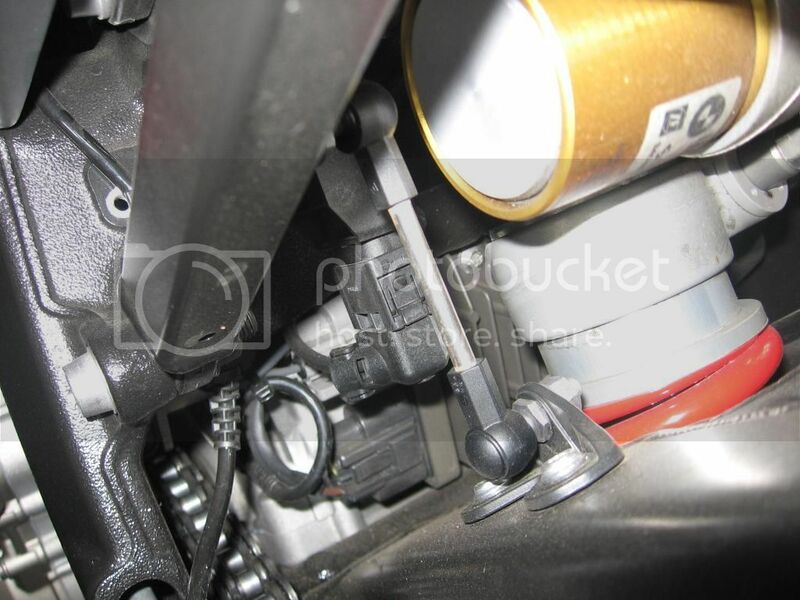 If you go for it you have to make sure it doesn't alter the rear shock / swingarm travel sensor for the DDC. You would have issues if that sensor geometry was altered. Not in a big rush for this but thought I would ask for opinions. I would drop the front the same amount in any case. Should be easy with the standard forks. Not sure about the DDC being effected. I'd have to learn more about how and where the sensors are. I assumed they were internal. I probably wait until a few others try it who understand more than I do. I'll check on the RR forums as they've been at this for many years now. 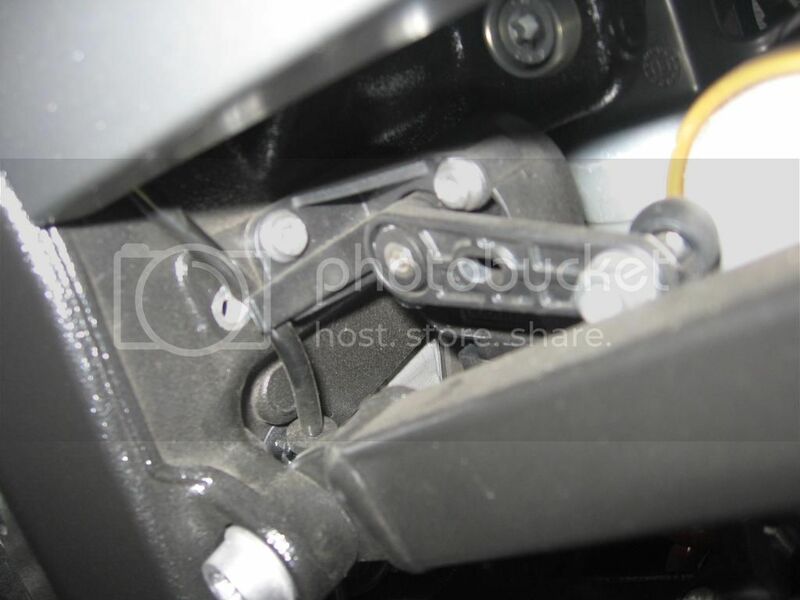 The rear sensor, which is the only suspension travel sensor on the bike, is bolted to the frame section right underneath the gas tank, just under the front of the seat. The other end is bolted to the top of the swing arm. You can see these mountings in the two pictures below. Altering this travel geometry will affect how the DDC works. If it doesn't change with the lowering you should be good to go. I think calling that rear sensor "bolted" in, is a tad optimistic. When I first saw it, I was surprised at how fragile it looked. All the linkage bits and the bracket are plastic, and on mine, the bracket doesn't even sit flush. It looks like it's just held on by a couple of sheet metal screws. Perhaps it's all meant to be sacrificial- breaking away if things got too abusive to save the sensor and whatnot? Anyway, I would agree that any geometry changes take this into account. Funny I was just looking at that yesterday and amazed. It looked like it came off a plastic toy model airplane. But it does seem like you'd need to deal with that if you lowered the suspension. Maybe you could adjust that arm to match? When you adjust the preload it must effect it so maybe you have a little bit of play where it doesn't matter. The arm does look like it should be adjustable what with the hex sided ball socket fittings and all. However it is so flimsy looking that I would make sure that I had a spare part ( if available ) in hand before I would try anything with it. This SHOULD NOT be that expensive of a part. I imagine that the sensor is nothing but a potentiometer. It doesn't have to do a lot, just change resistance as the rear travels. Yes, preload does affect this but also spring rate too. One of the reasons why the heavier riders report harsher suspension.